Someone calling themselves Russ posted on Sierra Foothills Report. 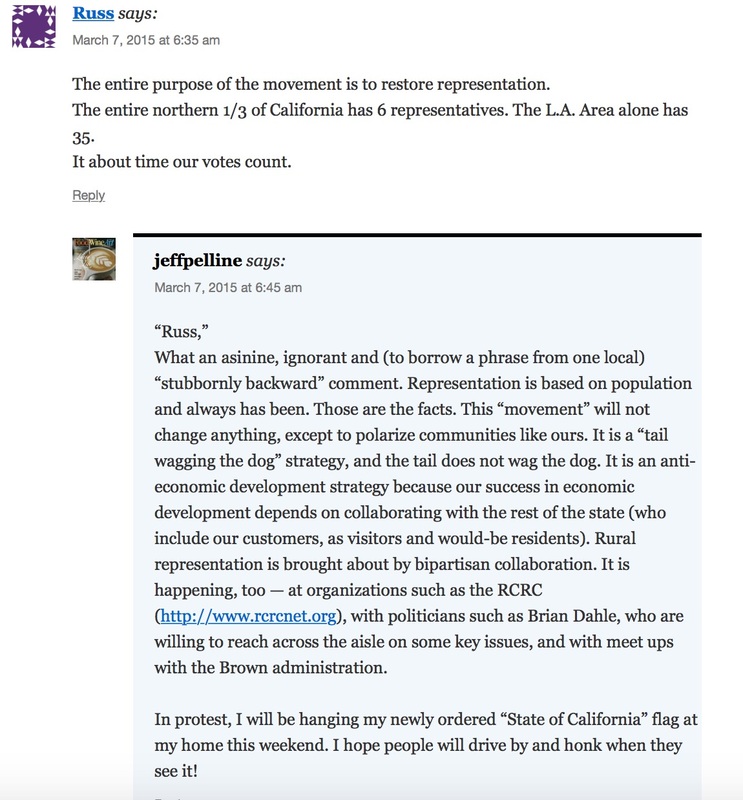 It was not me, I do not post on Mr. Pelline’s blog as most of my past comment were moderated into the bit bucket. While this is not me, I do support the Jefferson movement. The Constitution was not meant to protect us against changing times or changing technology. The Constitution was meant to protect us against the good intentions of well meaning tyrants. The Constitution was meant to protect us against human nature, and human nature never ever changes. We can restore Constitutional Republic to a small rural resource state. We can do it! We can secure Liberty for our posterity! We owe this to our children..
We owe it to our fathers and fore fathers not to fail. This will not be easy. It will not come without tremendous sacrifice. We the people have been asleep and compliant for a very long time. We have allowed all that has happened to us. Thank God it is never too late to stand and be counted. I think you have hit the nail on the head with the hammer Barry. The reason the SCOTUS rules is now moot. So we should return back to a geographical apportionment with the State Senate. makes perfect sense. I do not think that my reasoning destroys all of Reynolds, but only a fraction. The Reynolds court should have made a more narrow ruling that states cannot have geographic representation that is implemented and maintained on the basis of the race of the voters. I think that economic and environmental reasons for geographic representation should be fine and not a violation of equal protection. Just like the Senate. In fact the MIT article concludes that a mix of representation based upon population and geography may lead to better representation overall. I was thinking of ways to get around Reynolds also. I wonder if one house of representatives of a legislature could be elected by the BOS in each county. One county, one senator. I am wondering if you guys would agree that before Nevada County adopts a resolution supporting secession from California that they should do an economic analysis to determine: 1) the portion of state debt the taxpayers of Nevada County would be required to take on (which I estimate at approximately $ 2 billion based on an estimated state debt of $778 billion and the portion of that that would be apportioned to the roughly 1,000,000 residents of the SOJ and the 100,000 residents of Nevada County), 2) the tax base that would remain in Nevada County and the levels of service we could expect with the new tax base 3) the tax increases necessary to maintain the new desired level of service, 4) the cost of acquiring state facilities in our County, 5) and the legal costs of defending a secession? Really curious about peoples response to this question. Should our board of supervisors take action on such important matters without having a clear picture of the potential costs and consequences? Of course it is OK. I learned that in the Truckee incorporation hearings. Even though we did the studies that said it was not economically viable the people still voted it in. All political. I have always supported an economic analysis of any legislation or initiative. Years ago Measure D was an initiative to force county and city government to do an economic analysis of any change to their General Plans and implementing zoning regulations. It was defeated. But, I still support the idea, and support a Jefferson economic analysis. The real issue is what is included in the analysis and the assumption made based on the data provided. This is the real hard part of an economic analysis. Respectfully Russ, Measure D would have done much more than require an economic analysis, it would have required payment for any loss of value resulting from regulation, thus fundamentally changing the definition of takings, and as such would have likely been struck down by the courts. I had forgotten about that provision of Measure D. Would have been a better initiative if we has just focused on the economic analysis. I am told there is an economic analysis on the SOJ website. There is no economic analysis on the SOJ website, there is a spreadsheet done by some guy called Red “The Bear” Smith that compares taxes and services in a set of counties that is not coterminous with an LAO office report on the site on issues related to the failed Six California’s initiative. Perhaps so Russ, although as I remember it the economic analysis was not really the point, the compensations was. But if I remember correctly the turning point for the voters was the point that Measure D would have likely cost the County between $3-$10 million per year. Unknown risk is always a political liability. The cost will be the Achilles heel of the State of Jefferson. Cost was under the County control, all they had to do was quit destroying people property and wealth with regulations that were of questionable public benefit. With an economic analysis, they would know the cost and could compare that to the potential benefit. If the cost exceed the benefit, they do not pass the regulation, or is some cases resend the regulation. So I guess you do remember that part. Some of It is coming back to me, as you mention aspects of the initiative they are tickling my brain cells. It seems so long ago. You really should read the Harvard Environmental Law Review article if you have not Russ. It is an interesting analysis of Measure D, and you play a prominent role in the article as well. I had forgotten about the plans some of us were making at the time to challenge the ordinance in court should it pass. OK, I will find some time to read it. All, great discussion. Thanks for not resorting to name calling! Good job by all. The article and the Reynolds decision show something interesting. In Reynolds the Court was adjudicating a case where clearly Alabama was using “one county one vote” as a tool to discriminate based upon race. However, the article concludes that California citizens used “one county one vote” as a system to distribute state dollars. While the Reynolds decision was necessary at the time in stopping the continued and disgusting racism in Alabama, one could argue that Jefferson’s proposed “one county one vote” is not violative of the Constitution because the plain purpose is to affect geographic distribution of power and not to discriminate based on race. There is a clear gap between Reynolds and Jefferson’s proposal that could be exploited by a good lawyer. Thanks for the article and link to Reynolds. Very interesting reading. Any effort to change Reynolds would have to go after that standard, which, since ‘one man one vote’ has numerous additional precedents in case law now based on reynolds, might be very difficult. Change the facts of Reynolds, and it is easily distinguisable. It could be an interesting case given a different composition of the court. All academic until it happens. I thought the MIT piece giving the full history of the debate in California was really interesting. Like most things, more complex than people think. That was super cool. I am going to go back and read it again more carefully when I have an hour or so. Also read justice Harlan dissent. He pokes the first hole in Reynolds. I need to read Reynolds again too. It has been a few years…like 12! Here is Everett Dirksen’s comment at the time. I think he was right on the mark! Yet Senator Dirksen failed to pass a Constitutional amendment overturning Reynolds. True he failed but things change. Hell, look at the Selma March, that certainly changed the status quo didn’t it? So, I have hope that we can return to common sense in America and away from liberal batshit politics. The reasons the SCOTUS voted “one man one vote” for every legislature except the US Senate are now reversed. Reynold v Sims decision used the UNDER representation of urban areas as the reason to implement the decision. I find it interesting that no challenge has been made to reverse the bogus Warren Court’s decision. Rural America is toast. Todd, how are the reasons reversed? Apportionment in California is now based on population, so the conditions are consistent with Reynolds. Changing the population based formula would reverse the SCOTUS mandate in reynolds and put California out of compliance. You want to challenge Reynolds, go ahead, more power to ya’, but until it is reversed it is the law of the land. You missed my point. I agree California conformed to the SCOTUS decision and it was as I said. Read it and you will agree. I see a double standard with Reynolds as do many others. Do you disagree the rural areas have and are shortchanged? Please elaborate on the double standard created by Reynolds. I think the SCOTUS was quite explicit: apportionment represents people not geography. Rocks and trees don’t vote, people vote. But to answer your questions directly, I agree with you that in the substantive areas of allocation of state financial resources based on values returned on the investment, rural regions of the state in general are shortchanged. In particular, the values that rural landscapes provide in ecosystem services, like helping to regulate the climate, clean air, recreation, water provisioning, food and fiber, etc. are routinely undervalued because ‘public benefits’ are not calculated in their valuation. For example, we value an acre foot of water in the SWP at about $120 per acre foot…the real value of that water to the public, and downstream private users, is much much higher. I was at a water auction in Bakersfield this summer where water from the SWP was being sold for transfer from one farmer to another at $1400 per acre foot. What I disagree with the SOF advocates on is HOW we reverse the historic disinvestment in rural regions, not that it needs to be reversed. I am distressed that focusing on things like the SOJ that will simply never happen diverts us from the building the broad based coalitions necessary to advocate for increased rural funding that we deserve at the state and federal level. Words have actual definitions you know. You do realize how illogical your statement is don’t you? SCOTUS ruled on Reynolds based on the Constitutional question of under representation….if you go back to under representation you are out of compliance with Reynolds. The SOJ could not legally apportion delegates based on geography. That is really the key point. My statement is totally logical. What is good for the US Senate should be good for the state legislatures. Assembly by population and Senate buy county or district. I see you are the one out of sync. I think you missed my point Todd, it does not matter one whit what you, or I, think the law ‘should’ be, the law is the law, and the only way to change it now is to change the law, and until that is done, Reynolds and its standard stands, both for California and the mythical State of Jefferson. Creating a SOJ does not abrogate federal law, it merely means a new entity must comply with it. Saying, “What is good for the US Senate should be good for the state legislatures” is like saying “I want a pony,” and its why tis whole thing is so ridiculous. Saying it don’t make it so. You still miss the point because you have a bias. If the country is made of states and their populations are quite varied then my point is totally correct. The SCOTUS specifically excluded the US Senate from the same rules it posted for the individual states. Thereby creating discrimination. As does “one man one vote”. Where is the gal in that? Anyway, when exclusions are made for one group you libs go batshit crazy and here we have a perfect example of pinheads of the Warren Court creating a dysfunctional set of rules for the peons. I would have expected you to support overturning Reynolds as it would gie rural areas more representatives therefore more grant money. Regarding SOJ. I am on record as saying it is fantasy so I am not part of the attempt. I think we can achieve the same thing by overturning Reynolds and states can remain intact. Unless of course you were a peon living in Los Angeles and under the previous system you ‘vote’ was outweighed 428 to 1 by a vote in Alpine County (which today would be more like 800 to 1). The thing you never get Todd is that the law is not what you wish it to be, it is what it is, and Reynolds is now precedent. You want to overturn Reynolds you need to elect a state legislature that will do so to farce a new decision by the SCOTUS or pass a Constitutional amendment. precedent? There is no such thongs. I have a pen and a phone. What you fail to get Frisch is that there in nothing cast in stone and the SCOTUS can be reversed in most anything. Hell, they found abortion in the Constitution. That must give you pause. No, I think the Founders had it right and the Warren Court was wrong. There is a movement to return to the original intent as written. You know, plain laguage. Alpine County is a egal entity and through no fault of its own has been taken over by LA County. I would think you would support Alpine County. There is such a thing as ‘legal precedent’. Precedent can be changed, and I laid out what would need to be done to change it, until then Reynolds is law. I guess my reference to the 428 to 1 ratio between LA and Alpine counties was lost on you, clearly because you did not bother to read the links I posted. No it appears you are stuck and can’t figure out your opinion. There is no precedence. Any law can be changed and the best example is the “separate but equal” which was “law” for may years. You are just dense. Regarding the Alpine County example. All I can say is California has 38 million people with two Senators and Montana has a million with two Senators. Tosses your logic into the atmosphere. So, logic must be hard to find at higher altitudes. First Todd, it is not ‘precedence’ it is precedent. Second, you must be missing my point, of course laws can be changed, but they are law and precedent while they stand. Finally, the Reynolds case lays out quite clearly why precedent for the Federal Senate is not considered precedent for a state senate. Once again, you are captured by “I want a pony” and I think “it should be” like this, but it is not. How would it be fair for the 1,159 residents of Alpine County to be represented by one Senator and the 10,017,068 residents of Los Angeles to represented by another? All the residents of Los Angeles would need to do is amend the state Constitution, which they would surely do. And I can virtually guarantee the proponents of the SOJ that the California legislature would NEVER vote to allow the state to be split up, which means the whole discussion is one huge exercise in not only futility, it is a colossal waste of public time and money. Thanks for the spell check. Liberals are always aware of that kind of thing. I am in disagreement that a law in place is the law. I suppose those people marching in civil disobedience against segregationist “laws” in the south should have just stayed home under your way of thinking. I still can’t figure out why you would oppose a legislature that gives both rural and urban a fair shot. You libs are all in to fairness. No one is saying you don’t have the right to try to change the law; go for it. By the way, it is kind of disingenuous of you to portray the march on Selma or other civil rights actions as an attempt to change the law; the marchers were marching in support of enforcing federal laws regarding voting rights, specifically the 14th amendment, which they claimed, and courts found, took precedent over state laws restricting voting rights. They were marching in SUPPORT of enforcing federal law. The Voting Rights Act which clarified the 14th amendment merely put more teeth in the law to give it the ability to counter local segregation laws. But I do agree with you that if people believe a law is unjust they should have every right to peaceably assemble to resist that law and advocate for its repeal. I am merely stating that the SOJ people are not being honest about the law, and what would need to be done to have the representation they are claiming. They could not create a state that is recognized by the federal government that does not recognize federal law. They would need to change the Constitution, which is a lift they could not achieve by merely becoming a new state. They would still be subject to the federal law. Just as they would be subject to the Reynolds precedent, the SOJ would also be subject to every other federal law they are implying they could somehow not be subject to, like the National Environmental Policy Act, the Clean Air Act, the Clean Water Act, and all relevant federal laws that govern federal lands. If you read their resolution is explicitly calls out the ‘reinterpretation of federal laws governing resources’. They would have no more power over those laws as a separate state than the State of California does. Oh, and ‘legal precedent’ and precedence are actually two different things. Thus my correction was not a ‘spell check’, it was a correction of an incorrect assertion of fact. Selma is a truly close argument match. People are being treated poorly by a unjust “law” so they marched to change it. Pretty simple. Regarding spelling, yes words have meanings, thanks for reminding all of us. I think you guys are missing and important point in this discussion. As shown by the MIT analysis the principle of “one man, one vote” was not enforced by the California State Legislature, as a matter of fact apportionment was unequal until the Reynolds decision, which was made by the United States Supreme Court. Should there be a State of Jefferson, and should that SOJ seek to apportion seats based on geography rather than voters, then the scheme would still be unconstitutional under FEDERAL law. The SOJ apportionment would still need to be compliant with federal law. It has always been my experience that when people are as verbose as you appear to be, (post after post after post) that they are really uncertain of their positions and are actually trying to convince themselves rather than other. Seriously Todd, talk about derivative nonsense…I seem pretty sure about my position. I just read the back and forth Pelline has with Barry Pruett on SFR. That Pelline character consistently shows why he is despised here in Nevada County. What a rotten person. And now he wants kudos for flying the flag! Jeeze what a dope. Also, California I believe used to have a Senator from each county up until the 60’s if I am reading history right. Maybe someone could verify that. That is typical Pelline. Not only does he promote censorship, he too censors his commenters. Good thing the community at large has his liberal and highly biased number.